Interfaces define a contract for classes or structures. This helps to support polymorphism in object-oriented programming and assist automated testing when used for mocking. Visual Studio lets you to create interfaces from existing classes automatically. There are many reasons to use interfaces when using object-oriented programming techniques. Originally, interfaces were designed to provide a means for supporting polymorphism by enforcing a contract for all classes that implement the interface. Variables and method parameters that use the interface type provide polymorphic behaviour by allowing values of any type that support the interface to be assigned to them. The increase of tools for automated testing, particularly mocking frameworks, extend the use of interfaces. In these cases, it is common for interfaces to be defined that may only be implemented by a single class in the production code. The interface is also used in the automated test code to generate mock objects that mimic the behaviour of real objects and support the interface in an easily controlled manner. This often requires that an existing class's members be extracted into a new interface. To demonstrate the extract interface command, we will use the following sample code. In this case the code uses C# 3.0 automatically implemented property syntax to keep the sample code short. The above code includes properties and methods that may be useful for all types of two-dimensional shape. 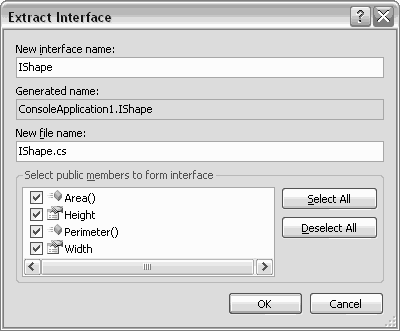 As such, you may decide to create an interface named "IShape" that contains the Width, Height, Area and Perimeter members. This can then be implemented by the Rectangle class and any other shape class that you may wish to define. It can also be used as the basis for mocking. To extract the interface, right-click within the class definition to display a context-sensitive menu. From this menu, select "Refactor", then "Extract Interface..." The Extract Interface dialog box will be displayed. New interface name. Enter the name for the new interface into this text box. As you type, the generated name will be updated. This name will be added to the list containing any base class and interfaces already implemented by the source class. New file name. The extracted interface will be created in a new file. This textbox is used to specify the name for that file. Select public members to form interface. All of the public members of the source class are listed in this box. If you wish to extract all of the members to the new interface, click the Select All button. Alternatively, check each item that you wish to be generated in the interface and uncheck those that you do not require.